The City of Ann Arbor conducted a visual deer count by helicopter fly-over on February 10, 2015. There are a couple of methods for assessing deer populations. 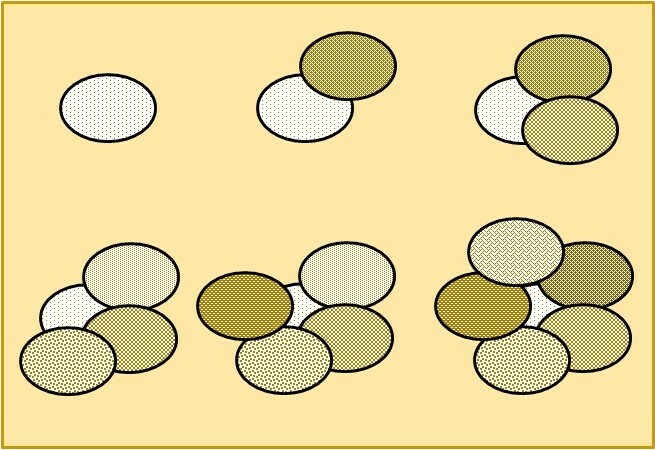 According to one recent study, use of a helicopter for visual counts while there is snow on the ground is as accurate as infrared, another frequently used, but more expensive, method. The City chose a day with good light and a good snow cover. As reported by the Ann Arbor News, all areas of the city other than downtown and “near hospitals” were surveyed. According to the News, a second fly-over was conducted in early March. 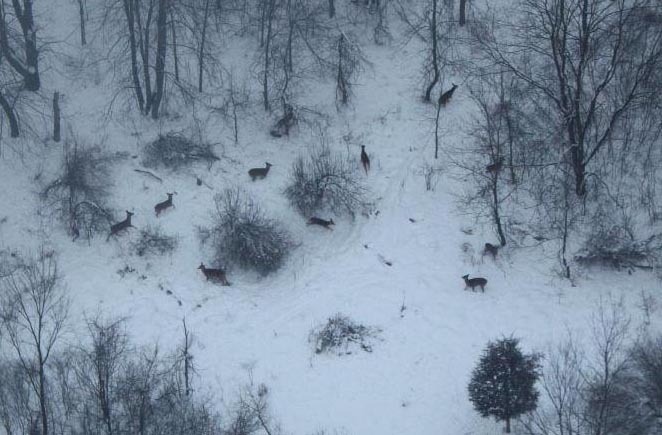 Aerial survey of deer in a Washtenaw County natural area, 2014. Photo by Shawn Severance, WC Parks. Once we have some numerical information (ideally, this would pinpoint herd numbers in different areas of Ann Arbor), we’ll need to identify the method to reduce – or, euphemistically, “manage” the population. Ann Arbor is coming late to this discussion. Wildlife biologists and managers all over the U.S. have been studying this issue for at least 25 years. A great deal has been learned from careful observation of deer population dynamics and behavior. We reviewed a critical part of this question in our previous post about deer population growth. Deer have tremendous reproductive and regenerative capability. So a program intended to reduce their numbers and their impact on our local environment must take that into account. Killing the deer will only result in bringing more deer into the city from adjoining areas. Because it will be ineffectual, it is therefore pointless and needless cruelty. 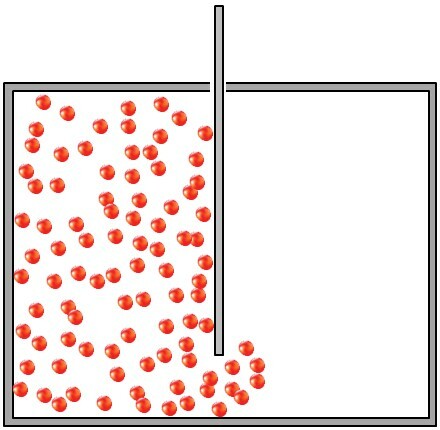 If gas molecules are suddenly given access to a vacuum (by lifting the barrier), they will rush in and fill the space so that density evens out. The “vacuum effect” is based on an assumption that deer behave as gas molecules do. Supposedly, if a vacancy is created in one area, deer will somehow sense that and there will be a massive flow of deer into the opened-up area. Soon we’ll be back to the same numbers as before. Many studies have shown that deer don’t behave this way. Instead, deer favor a home range. They mostly migrate into new areas only because they have exhausted the food in their home range. In other words, if they have exceeded the carrying capacity of their current range, they may migrate. But this is not caused by a vacuum created by the removal of other deer. Deer Management introduced the key model for home ranges of does. This was one of a long series of papers by William F. Porter (now at MSU) and his students in which meticulous research (using radio collars and other increasing refined and sophisticated tracking mechanisms) has followed individual deer to map their behavior under different conditions. The rose petal model, after Mathews and Porter, 1992. Circles are home ranges of individual does, about 1/4 mile in diameter. The rose petal model proposed by Mathews and Porter states that deer are matrilineal in social organization; does stay close to their mothers. The first circle is the home range of a doe (these home ranges are quite small, only about a quarter of a mile in diameter). Her daughter establishes a home range that slightly overlaps hers. Subsequent generations continue to overlap the original doe’s home range in a pattern resembling rose petals. This type of close association within a family structure is termed philopatry. The significance of this behavior to management is that if the deer in a particular very localized area can be eliminated (or significantly reduced), that area will likely stay empty of deer for quite a while. Over time, adjacent family groupings will begin to encroach on the area, but that will not be immediate. Bucks have larger home ranges. And yes, does will move farther under certain circumstances, usually when the food available no longer supports the herd, in other words when they exceed the carrying capacity of the immediate area. (We discussed this concept in the previous post about Deer and the Numbers Explosion.) This movement to a new feeding ground is called dispersal. Population reduction programs at our study area did not cause the resident deer population to expand home range size or shift into adjacent habitat. We believe that localized deer reduction programs can be effective tools to manage problem deer herds. Deer removal efforts initiated to reduce deer damage to vegetation, particularly in urban areas, may have an added effect of reducing foraging range of the remaining resident deer. Presumably, a program of deer management for Ann Arbor can use similar pinpoint deer population reduction. This will benefit our wild and cultivated areas, and even the health of the surviving deer themselves. Even in our lush urban environment, some deer are beginning to show signs of food deprivation. 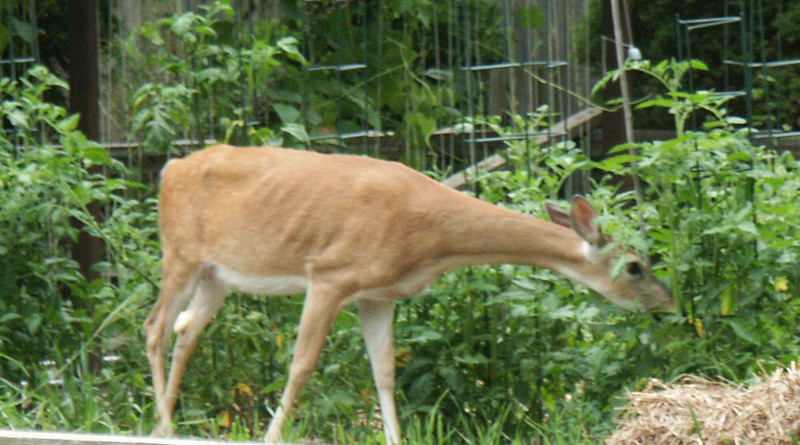 Deer browsing in a vegetable garden in Ann Arbor. Note the visible rib structure. Note: An ongoing list of posts on this subject, together with some other resources, is on our page, What Do We Do About the Deer? 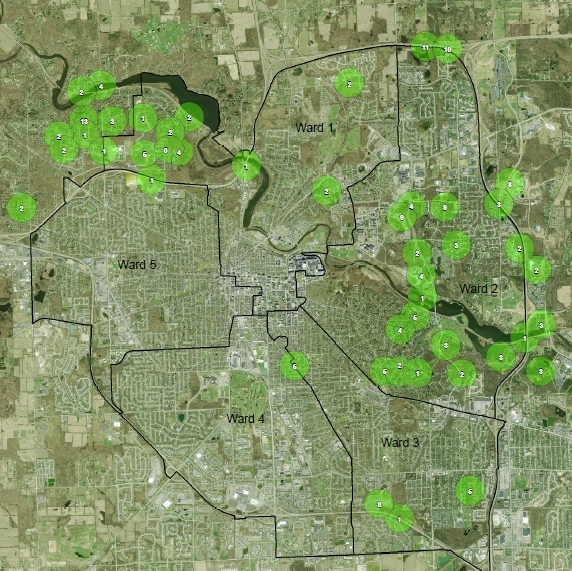 UPDATE: The City of Ann Arbor has now posted maps of its two fly-over deer counts. Here is the February 10 and here is March 6. This entry was posted on March 8, 2015 at 3:23 pm and is filed under Sustainability. You can subscribe via RSS 2.0 feed to this post's comments. You can comment below, or link to this permanent URL from your own site.